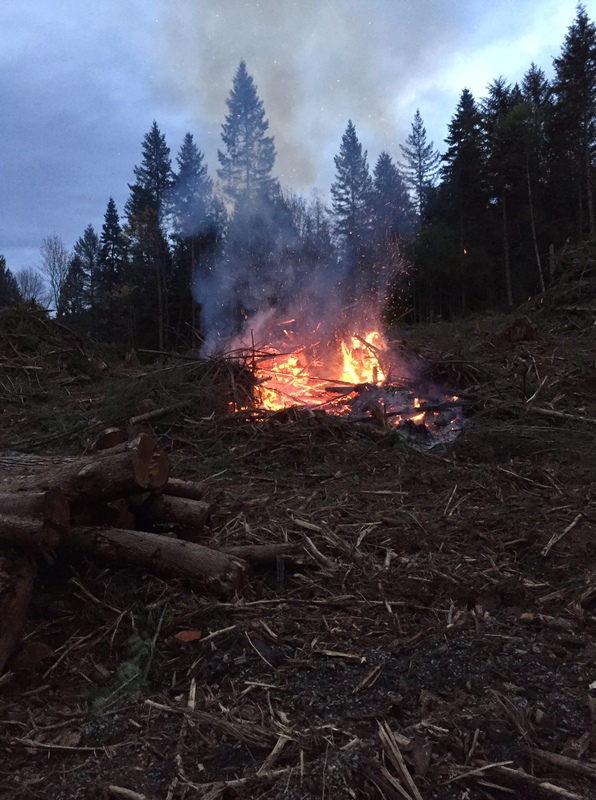 Recently, we did some logging in our small wood patch. It is our responsibility to burn the piles. They are huge. They are wet. There are 15. We are under a time crunch so new trees can be planted this winter. Wow! What a challenge. Here’s what we did. Rob started early this morning. By around 10 a.m., pile #1 was starting to burn a bit. 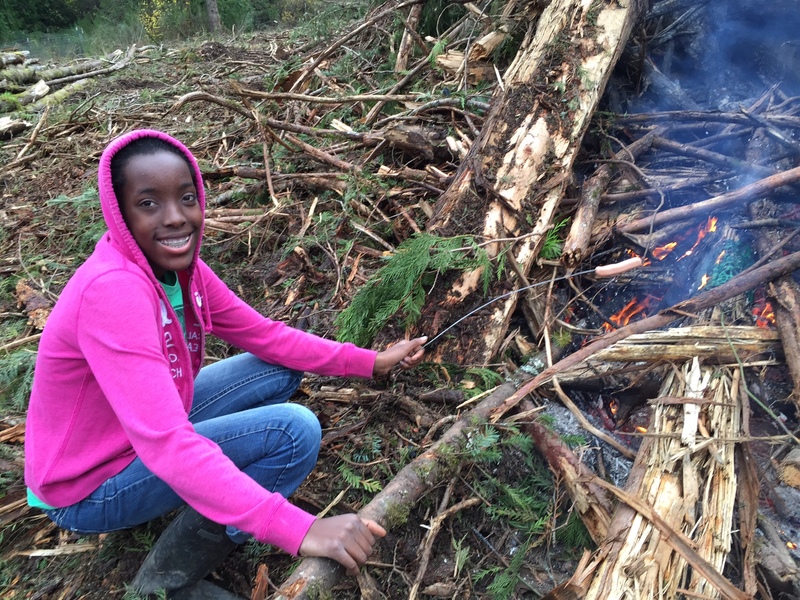 Ja’Ana got some marshmallows and hot dogs and started roasting. This time, she used a roasting stick made from an old coat hanger. Pile #2 was sulking along. 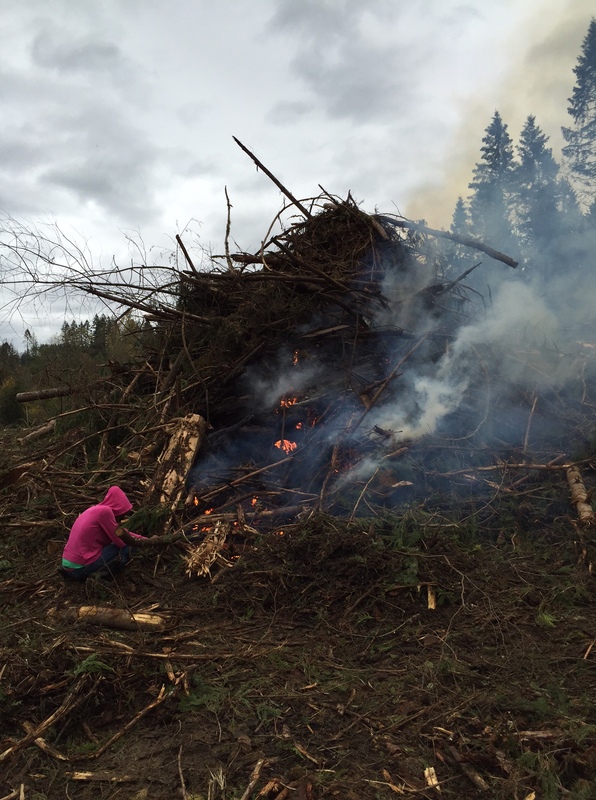 By noon, pile #1 was ablaze. Pile #2 was not, so we both continued feeding the small flames with small branches, larger sticks, dry old lumber, cardboard boxes, and Rob was using a propane weed burner. It began to burn merrily and we thought it was going to go. Morning turned into afternoon. We decided to not try to start other piles, but to concentrate on the 2 we had going. Rob pushed them together with the tractor. Pile #1 was now blazing. #2 died out again. Tomorrow’s another day! Both piles were piled up by the same loggers at the same time. Both are wet wood. Both were started at the same time. The conclusion we came to was that #2 was too loose. For a pile with wet wood to burn well, it must get really, really hot–hot enough to dry out the wood and let it burn. When it’s too loose, it burns up the pine needles, small branches, etc. too quickly and the larger pieces cannot get started because they are not hot enough. Also, pile #2 had quite a bit of dirt in it, which does not burn. The plan tomorrow morning is to start on another side, pile up a bunch of dry wood, get that going, and hopefully, #2 will burn. We expect that #1 will burn itself out during the night and Rob will push the remainder together in the morning.